Patients who miss appointments will be told how much they have cost the NHS, the health secretary has revealed. 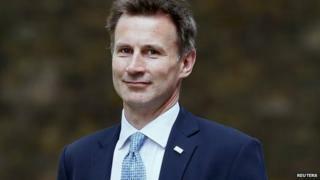 Overall, missed GP and hospital appointments cost the health service in England nearly £1bn a year, Jeremy Hunt said in a speech this week. He said he sympathised with the idea of charging patients for missing GP appointments, although there are no plans for this to happen. But he said people would have to "take personal responsibility" for NHS funds. In a measure announced in a speech to the Local Government Association on Wednesday, Mr Hunt said he planned to display the cost of prescription medicines on packets. The figure and the words "funded by the UK taxpayer" will be added to all packs costing more than £20 in England. The move is part of efforts to reduce the £300m bill for "wasted" medication, which is prescribed but not used. In the same speech, he said missed GP appointments cost the taxpayer £162m and missed hospital appointments cost £750m. Mr Hunt told the Question Time programme that NHS resources were stretched already, adding there would be more than one million extra people aged over 70 by the end of the current parliament. "If we're going to square the circle and have a fantastic NHS, despite all those pressures, then we have to take personal responsibility for the way that we use NHS resources," he said. Mr Hunt told the audience in Essex he did not have a "problem in principle with the idea of charging people for missed appointments." But he added: "I think in practical terms it could be difficult to do, but I've taken a step towards that this week by announcing that when people do miss an appointment they will be told how much that's cost the NHS." Labour's Jeremy Corbyn, who is standing to succeed Ed Miliband as party leader, accused pharmaceutical companies of holding the NHS "to ransom" by charging high prices for medicines. On the idea of charging for missed appointments, My Corbyn added: "I don't think it would be a very good idea. I think it would be very hard to collect it. "There are lots of reasons people miss appointments - some because they are lazy and can't be bothered, sometimes because they couldn't get there, all kinds of things." Shadow health minister Andrew Gwynne said the real reason people were struggling to see a GP was because David Cameron had scrapped the right to a GP appointment within 48 hours and cut Labour's scheme for evening and weekend opening. "Patients have a responsibility to attend GP appointments and to let their surgery know if they cannot attend," he said. "Many GP surgeries already remind patients about appointments using text messages and emails, and the first priority should be to expand the use of these services, rather than cutting the funding for them, as the government is planning to do."